Your Diamond Ring Could Be Turning into Graphite! As something that is immediately associated with jewelry, it’s quite surprising to learn that 80% of all diamonds are not suitable for jewelry. Another one of the more surprising diamond facts is that each stone will lose, on average, half of its original weight through the processes of cutting and polishing. However, diamonds are nevertheless an ideal option for jewelry because they polish well and are virtually scratch-resistant. They are so hard that they can only be scratched by other diamonds. 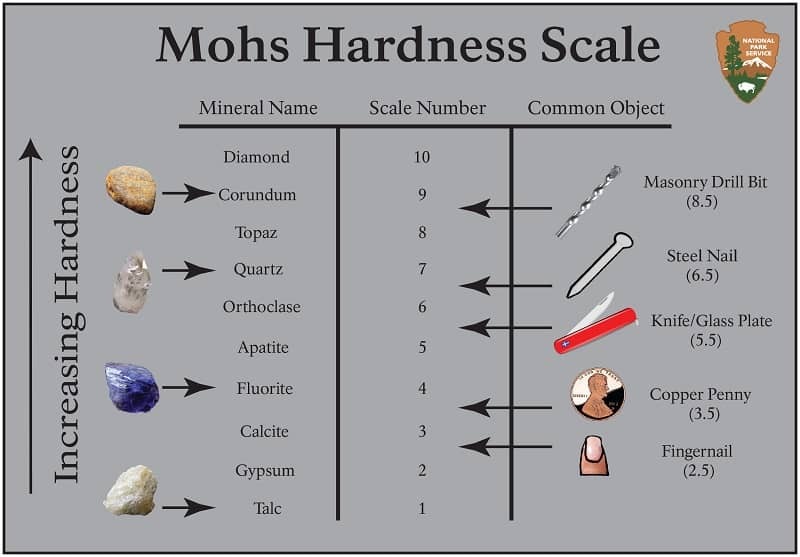 All minerals are graded from 1 to 10 according to the Mohs scale, with 1 being the softest and 10 being the hardest. Scientific diamond facts reveal that diamonds have a hardness of 10 on the Mohs scale. It is no wonder that these stones are used for industrial purposes, specifically with regards to cutting and polishing tools. Most people think of sparkling colorless stones when they think of diamonds. This is understandable, because most diamonds are pale yellow to clear in color. However, one of the more intriguing diamond facts is that these precious stones can vary a great deal in color. In fact, diamonds can be green, blue, red, orange, pink, brown and black. Of these, yellow and brown are the most common colors, with red and blue being the rarest of all diamonds. The strength and seemingly indestructible nature of diamonds has seen them heralded as gemstones of important significance since ancient times. Diamond facts reveal that in ancient times, wearing diamonds was believed to induce strength, courage and invincibility. Some kings were known to wear diamonds on their armor as they went into battle. Indian mythology influenced the Roman belief that diamonds, when worn as talismans, had the power to ward off evil forces. In addition, ancient Hindu devotional statues frequently used diamonds as eyes. The tradition of men buying diamond engagement rings for women is not a modern trend. In fact, this has been occurring for at least 500 years. The earliest record of this happening was in 1477: the then Archduke Maxmillian of Austria gave Mary of Burgundy a gold engagement ring, with diamonds spelling out the letter M. Diamonds have long been associated with love, even during ancient times. We know this because ancient Romans believed that Cupid’s arrows had diamond tips. 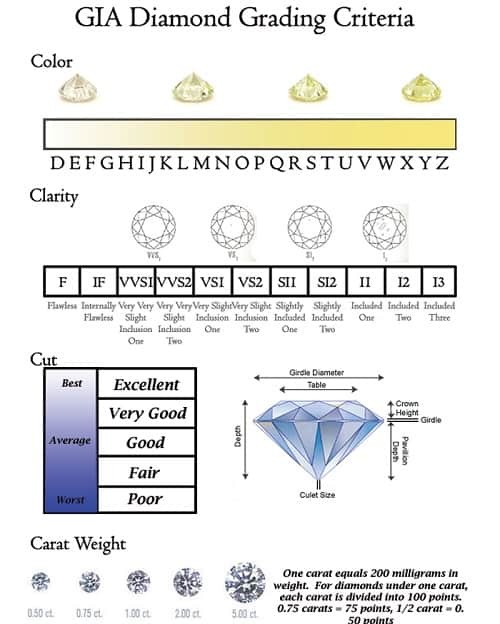 Diamonds all receive grades according to several criteria. There are four important Cs that you need to know when evaluating a diamond: cut, color, clarity, and carat weight. Diamond facts teach us that these four factors together, determine the rarity, beauty and, ultimately, the value of a diamond. Nature is responsible for the color, clarity and carat weight. Man is responsible for the cut, which is the most important factor because it has a significant influence on the final aesthetic beauty, value and grade of a diamond. The word carat comes from the Carob tree, which is found in the Mediterranean. For centuries, the seed of the carob tree was used as the standard measure of weight for all precious stones, including diamonds. One carat weighs just 0.007 ounces (0.2 grams). When it comes to polished diamonds, only one in a thousand weighs more than a carat. One of the lesser known diamond facts is that diamonds are actually thermodynamically unstable on the Earth’s surface. This means that the structure of diamonds is unstable when they are exposed to the normal temperatures and pressures that we experience on Earth. So what does this mean? It means that all diamonds on Earth are actually slowly changing into graphite. But there’s no need to worry about your diamond ring just yet: the process is so slow that it’s not discernible to humans. Ancient Greeks and Romans believed that diamonds were tears from the gods, or actual splinters of stars that had fallen from the sky to Earth. Interestingly, there is actually something in this belief. One of the lesser known diamond facts is that diamonds actually exist in space. Incredibly, white dwarf stars have a diamond core. But there’s nothing dwarfish about these diamonds at all. 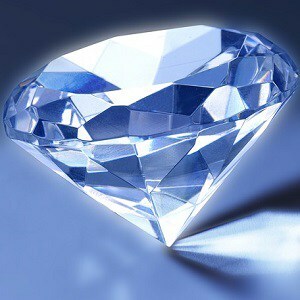 In fact, the largest known diamond in the universe weighs a whopping 2.27 thousand trillion tons. That’s an unbelievable 10 billion trillion carats! This star has been named Lucy, after The Beatles’ song Lucy in the Sky with Diamonds. In addition, there is a planet called 55 Cancri e which is composed almost entirely of carbon, and is, amazingly, one-third diamond! 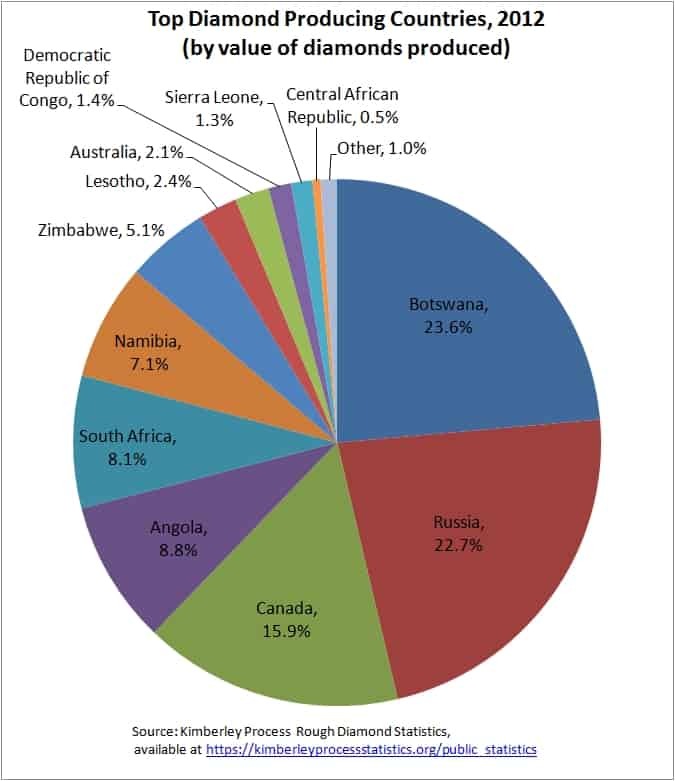 The term blood diamonds refers to diamonds that are mined in a politically unstable area and are then sold in order to finance war. There are many issues pertaining to ethics, violence, labor and the environment when it comes to diamond mining. 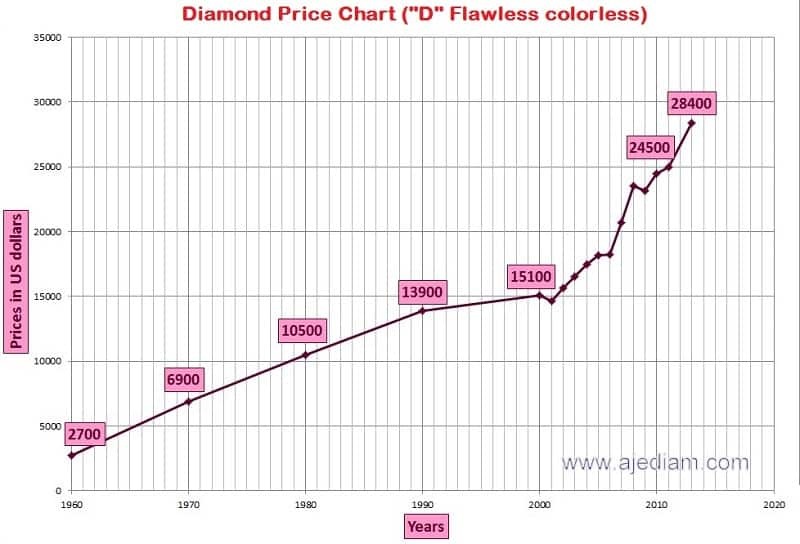 This is possibly the most concerning of all diamond facts. Although it is easy to see why diamonds are so popular and highly sought after, it does unfortunately then place them at the center of much conflict and controversy. Diamonds have fascinated people since ancient times, when they were believed to hold important powers. Although they have long been associated with love and jewelry, these tough stones are actually more commonly used for industrial purposes. The use of blood diamonds and unethical diamond mining practices remain a controversial issue to this day.